Trilliant shape diamond engagement rings use a brilliantly unique diamond shape that makes a stunning and distinctive symbol for a couple's unique relationship. The trilliant - or triangle brilliant - shape is a geometric modification of the classic round diamond shape. There are actually two types of trilliant shapes: those with the perfectly straight sides of a triangle, and those with bowed or curved sides that are reminiscent of the cushion cut as well as of the original round shape. Trilliants may also be called trillion or trillium diamonds, but the key is the prefix tri- which refers to the shape's three vertices. Trilliant diamonds have roughly 50 facets that lend them their extraordinary brilliance. The shape was perfected in the 1960s and 1970s, but because of its unusual nature it has not been as popular for engagement rings until modern designers embraced contemporary engagement ring designs. At the same time, however, trilliant shapes are exceedingly popular as accent stones because of their flared shape and unique nature. The ideal proportions for a well-balanced trilliant shape are 1:1 between length and width in order to maximize the appearance of the stone's carat weight, though many couples may prefer diamonds that are slightly longer or wider. Regardless of the precise proportions, the best trilliant diamonds should be high quality, because the sharp corners can highlight diamond color imperfections as well as magnify diamond flaws and inclusions. There are two ways this unique shape can be incorporated into stunning engagement rings: as center stones or as accent stones. Center stone trilliant shape diamond engagement rings are very difficult to find, but they are well worth the search for a unique engagement ring. As a center stone, a trilliant should be held securely in prongs that protect the delicate points of the diamond, though bezel settings are also popular options. Split shank diamond rings are also fashionable with trilliant shapes because the ring's band can help balance the unusual shape. The stone may be oriented in any direction, though the most popular choice is for one of the points to be aligned with the length of the finger. Baguette gems and additional trilliants are popular accents for central trilliants, though the distinctive shape is well enough without extravagant embellishment. Trilliant shapes are popular as accent stones for other diamond shapes that incorporate sharp points. Princess, radiant, and marquise shapes frequently use trilliant shapes as accents because the stones can nestle closely to the center stone but have a distinctive sharp edge that tapers into the ring's band. 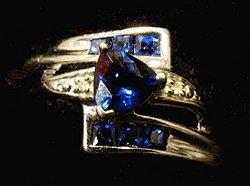 It is also popular to use trilliant shaped semi precious gemstones as accents to colorless diamonds. This is a stylish way to incorporate birthstones or other favorite gems into the ring while taking advantage of the unusual stone shape. Trilliant shape diamonds are difficult to find as center stones; if a couple is interested in a trilliant solitaire, they would have the best choice by purchasing a loose diamond and setting it into an engagement ring mounting of their choice. Semi mount diamond rings are also available that can turn a loose trilliant diamond into a stunning bridal set or other elaborate engagement ring. If a couple wants to use a trilliant gemstone other than a diamond, however, they can find different center stone designs more easily. While these rings are not usually classified as engagement rings, they are boldly colorful options to highlight the unique shape with a unique color. Another popular option is a bypass trilliant design, where two similarly sized stones are set next to one another for a wider ring that uses dual center stones. These gemstone designs frequently have diamond chips or other small diamonds as accents and can be found with fashion rings or birthstone jewelry. Finding trilliant accent stones is much simpler; many princess, marquise, and radiant diamond shapes use trilliant accents, and couples can also find designs with emerald or round center stones. 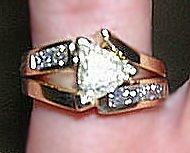 Matching sets are popular engagement gifts, anniversary gifts, and bridal jewelry. Trilliant shaped diamonds are popular in pendants and earrings, both of which can be beautiful for a bride or wife to wear to match her unique engagement ring. Trilliant shape diamond engagement rings are beautiful examples of modern geometry in classic jewelry. While they may be difficult to find, choosing a trilliant design is sure to emphasize the distinctiveness of any relationship and the woman who proudly wears such a bold and gorgeous ring.